No need to invest in batteries for your fancy alarm clock! This experiment shows how a simple household spud can be used as a battery to power small devices: the potato battery clock. BONUS: See how we use a kit to make this even easier below! First, strip off two inches of insulation from one end of all three copper wires. 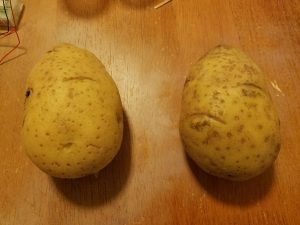 Cut your potato in half and put the halves on a plate flat ends down. 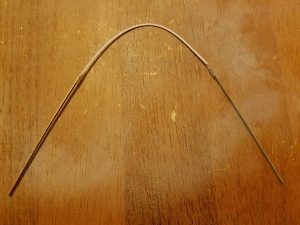 Wrap one end of wire around a galvanized nail and wrap another piece’s end around a penny. Stick the nail and the penny into one half of the potato and take care to make sure they aren’t touching each other. 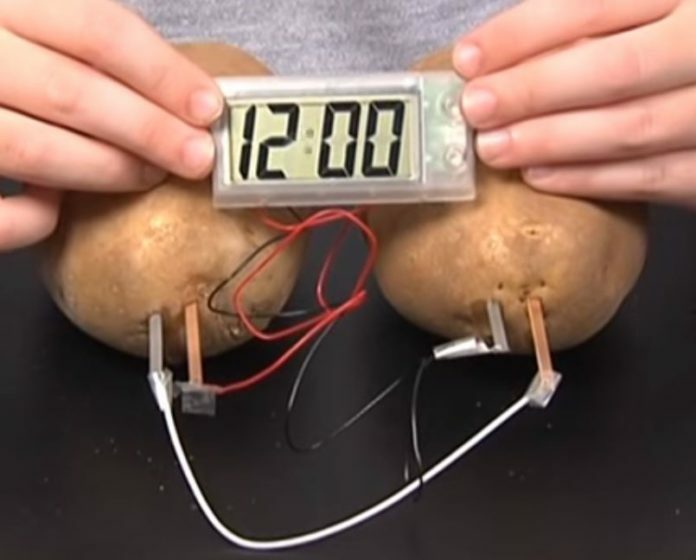 Wrap the third piece of wire around the second penny and put it into the other half of potato. Don’t put any wire on the second nail; instead put it directly into the second potato. 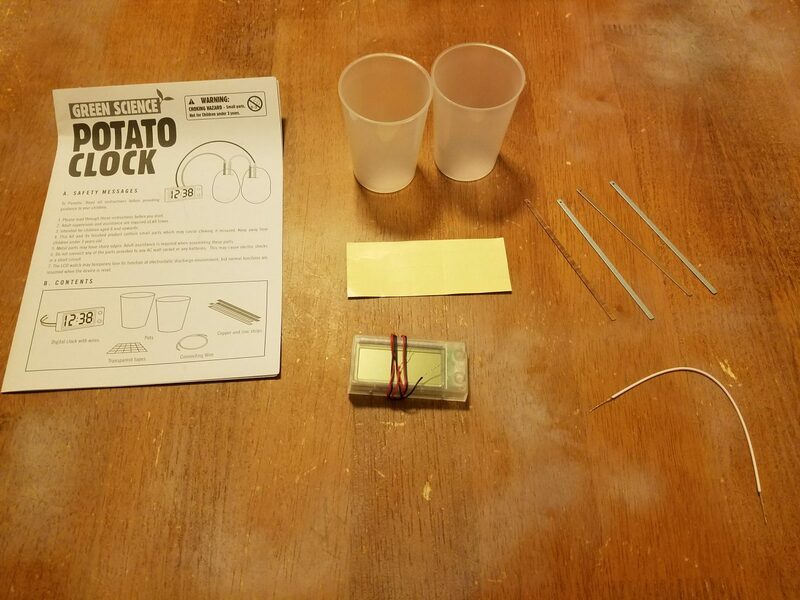 Connect the wire from the first potato’s penny to the nail without any wire on the second potato. Touch the free ends of the other two wires to the wires coming out of the digital clock. If nothing happens, try connecting the wires in different ways in order to alter the energy flow until it goes through the clock in the right direction. Just like batteries, the wires all need to be attached the right way in order for anything to work. For a visual of this experiment, check out this video link. The energy that powers this clock comes from the chemical change that happens when zinc from the nails dissolves inside the phosphoric acid from the potato. The zinc is oxidized, reaching a lower energy state by exchanging electrons with the potato. 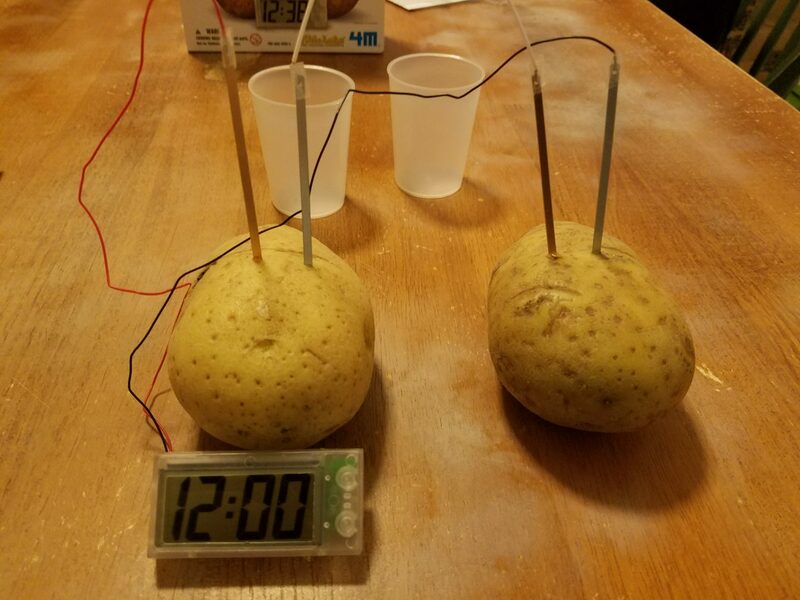 The energy to power the clock doesn’t come from the potato, but rather from the energy released during this chemical reaction. 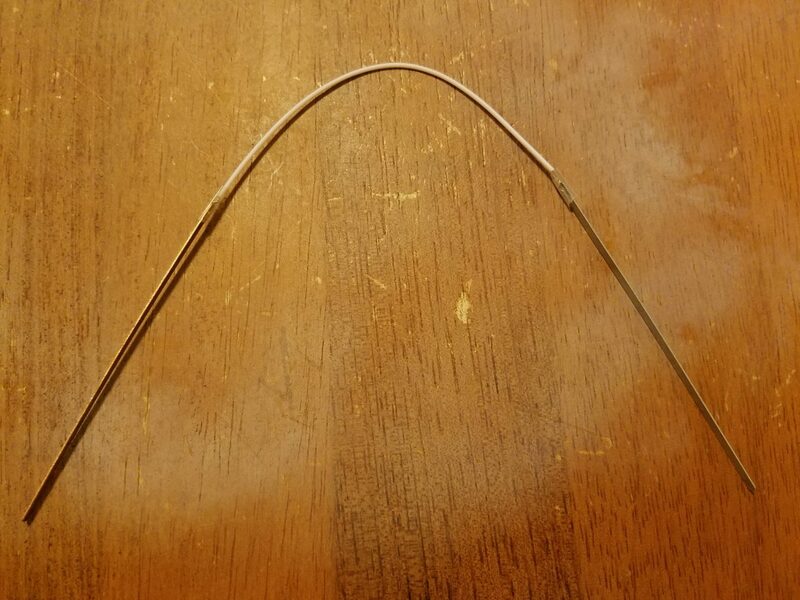 The zinc in the nail interacts with the copper in the wire, and the potato acts as a buffer between these two interactions. Without the potato, this interaction would only produce heat. 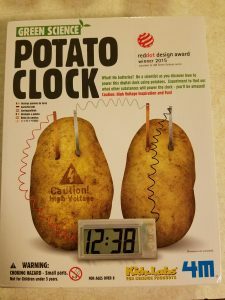 Since the potato keeps the zinc and copper separated, the electron transfer happens through the copper wires, which focuses the energy created into the clock. And that’s how it gets powered. This is an example of an oxidation-reduction (redox) reaction. 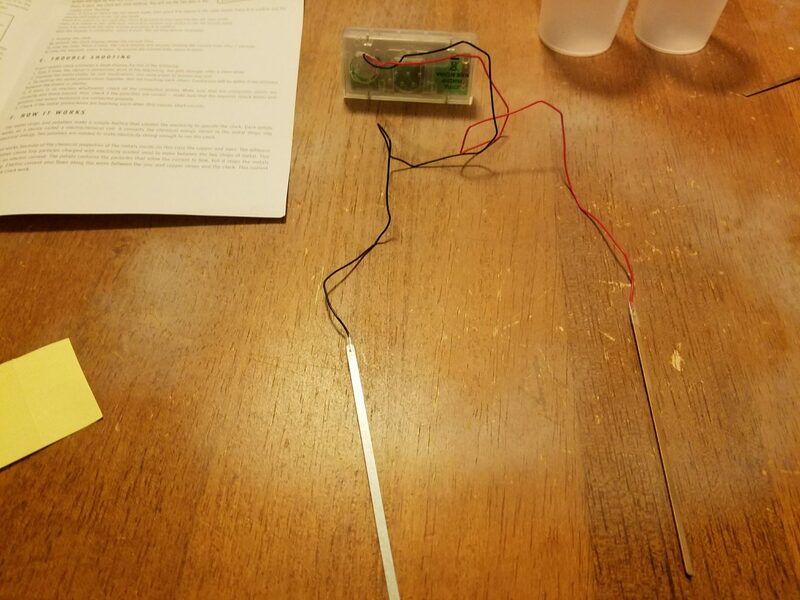 What we have created here is an example of a Galvanic Cell, which is two metal “electrodes” in an electrolyte. This tells us that the zinc electrode is dissolved by the reaction and copper is deposited on the cathode. We’re going to use this kit to show how easy this is to set up. Here is the kit unboxed to show what is included. 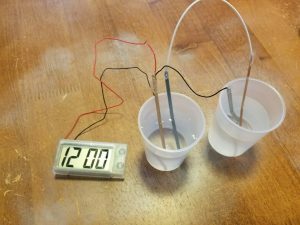 There are instructions, two cups for liquid experiments, adhesive tape for stronger connections, the low-voltage LED clock, four electrodes (two copper and two zinc), and a conducting wire. 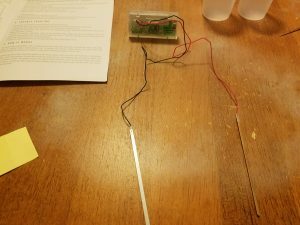 First, you’ll attach one of each type of electrode to the conducting wire and use the adhesive tape to make the connection tight. Next, prepare the clock part of the circuit by attaching the anode (zinc) to the black wire and the cathode (copper) to the red wire. Now, get your potatoes ready! 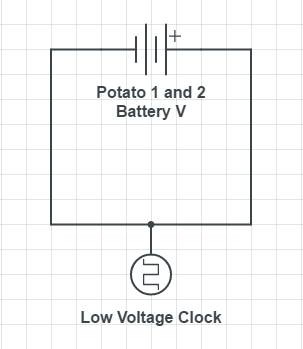 To set up the circuit, begin by connecting one potato to the other using the conducting wire. 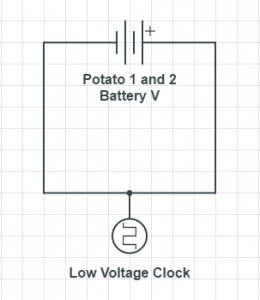 Then, to complete the circuit connect the opposite electrode in each potato from the clock, as shown below. 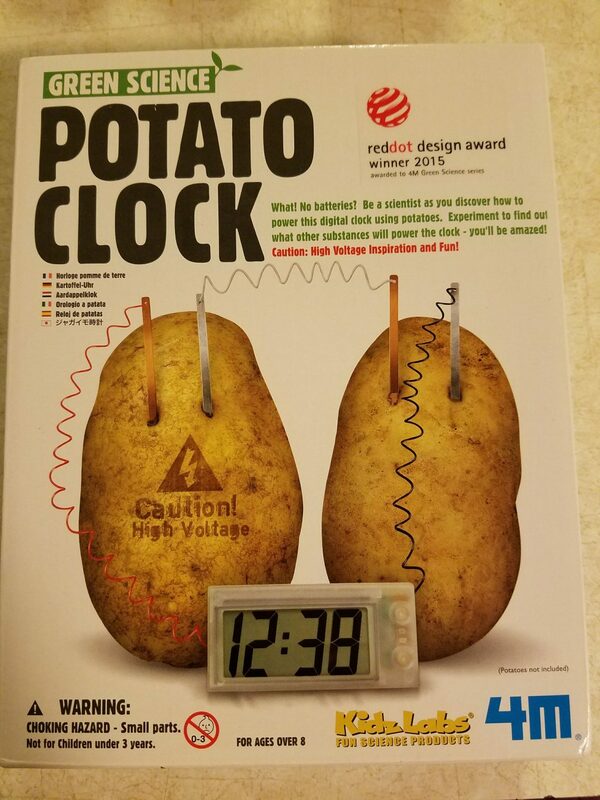 As you can see, you now have a functioning potato clock. The circuit diagram is very simple. We’re just scratching the surface of what you can do with this kit. For example, we know that the potato battery works in part because of the presence of phosphoric acid in the potato. 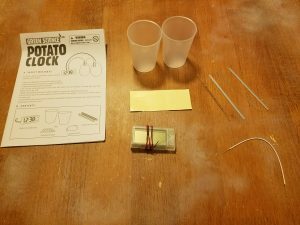 This is what makes the potato an electrolyte. But how do you explain this? That’s just tap water in those two cups. What is the chemical reaction now?